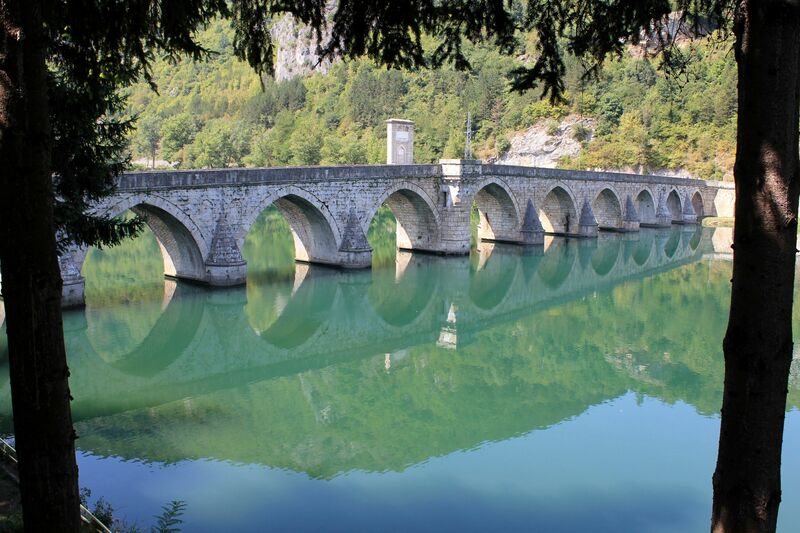 Drina Bridge offers historical facts and pictures of an old stone bridge built in Visegrad by Mehmed Paša Sokolović and made worldwide famous by the novelist Ivo Andric. Višegrad is a small town located on the banks of the Drina River in the eastern Bosnia Herzegovina. Frankly, it will be probably one of countless forgotten places on the map that tourists have to cross on their way from “somewhere” to “somewhere else” without ever looking back. 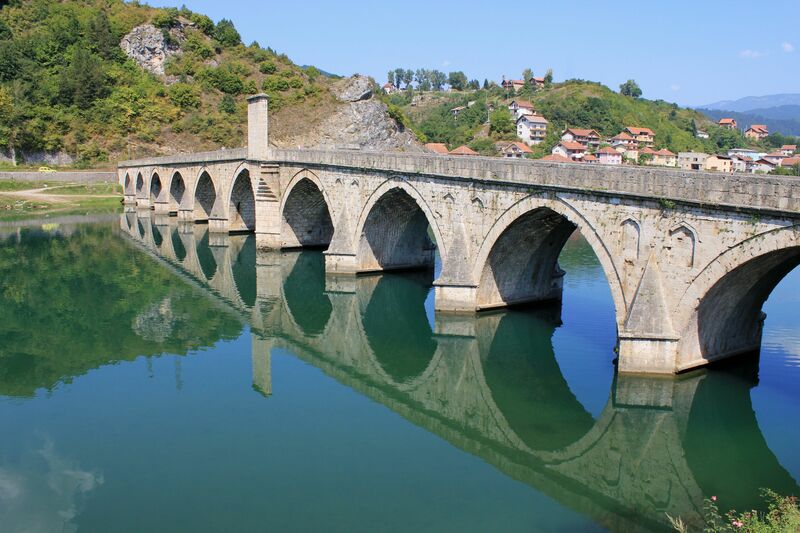 But the history wrote quite different scenario for Višegrad when at the end of 16th century Grand Vizier Mehmed Paša Sokolović ordered here construction of the stone bridge over the river Drina. The bridge was intended to provide a crucial link connecting the vast part of the northeastern Europe located in the valley of the Danube River with the Adriatic coast and then the capital of the Ottoman Empire - Istanbul. Drina Bridge - Profile of the bridge over Drina. Despite its monumental architecture, elegance of proportions and greatness of civil engineering, for centuries the bridge was rather a “local event”. Certainly it was greatly appreciated by merchants and valued by militaries in their endless conquest of Balkans, but with the exception of historians and “connoisseurs”, the bridge was not known to the larger public. Things changed in the middle of 20th century thanks to the novel “The Bridge over the Drina River” by Serbian novelist Ivo Andrić (winner of the Nobel Prize in Literature in 1961). Suddenly Višegrad, Bridge and Drina “connected together” started to resonate in all corners of the world, at least in the eyes of imagination of those reading the famous novel. 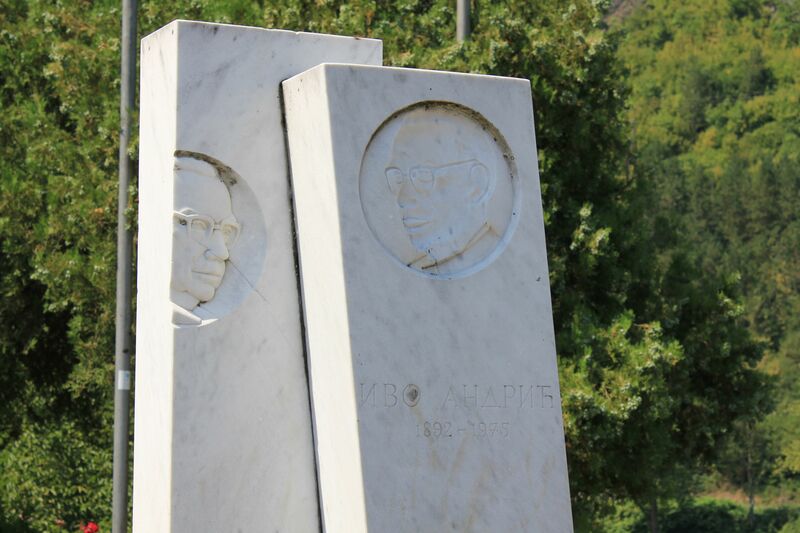 Drina Bridge: Monument to Ivo Andric (1892-1975) near the bridge over Drina. We use to say that one picture is better than thousand of words, but that may not always be true. Sometimes the words can touch deeper layers of human sentiments and emotions than a simple picture. Certainly this is the case of words written by Ivo Andric in his “The Bridge over the Drina River” novel. So only with the humbleness in front of such masterpiece I’m sharing with you on this page historical facts and pictures from Višegrad. The construction of the bridge started in 1571 and was finished in 1576. It was designed and built by one of the greatest architects of the Ottoman period – Mimar Kodža Sinan – “father” of several masterpieces of civil engineering across the Ottoman Empire. It is worth to note that 16th century marked by the reign of Suleiman the Magnificent (1520-1566) was a Golden Époque of the Ottoman Empire bringing the long period of peace and as a result - progress and prosperity. The 179.5 m (590 ft) long and 6.3m (20 ft) wide bridge has 11 masonry arches with spans ranging from 11 to 15 meters (36 to 49 ft). It ends with right angle access ramp on the left bank of the river. The whole bridge was made from stone and tuff (consolidated volcanic ash). It has a slight ascent towards its middle part. 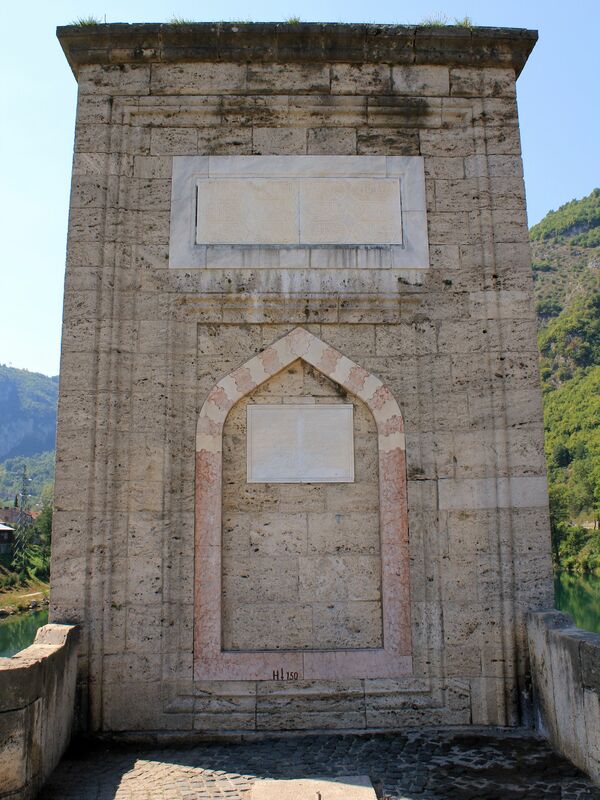 On the balcony at the center of the bridge there is a stone portal (Kapija) raised to the glory of Mehmed Paša Sokolović and a niche with stone benches – these days occupied by tourists gazing at the emerald-green waters of the river. In the past at the center of the bridge there was a wooden tower with imposing oak doors on both sides. The tower was used by soldiers controlling the traffic across the river and the mentioned niche was part of the setting. 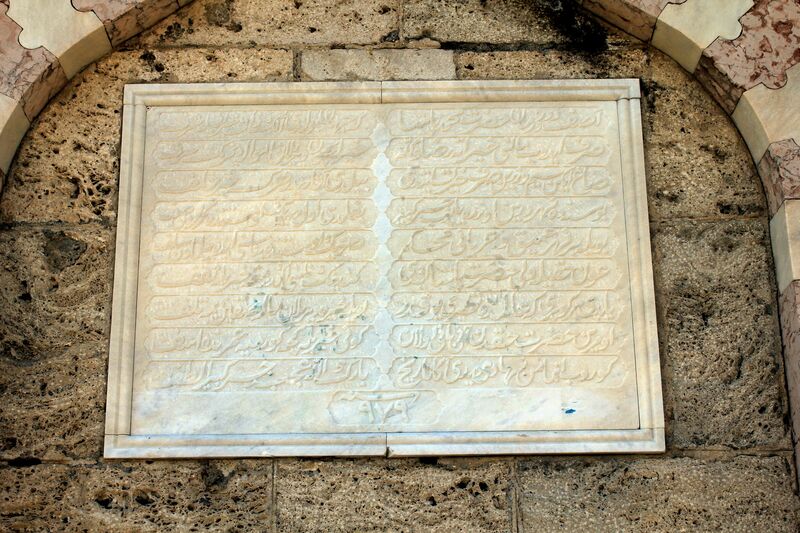 The stone portal holds two white marble plates with the texts attributed to Muhamed Karamusić Nihadija (Bosnian poet born in 16th century Sarajevo). They are written in Arabic so most of us (including myself) have to rely on available translations. Mehmed Pasha, the Asaf of this age and time Who has adorned the world with his noble person He has used his property to make charitable bequests, to please God No one can say that goods used in this way have been misspent In all his life he has spent gold and silver on works of charity He knew that with such works he would leave behind a beautiful legacy In Bosnia, over the river Drina he has made a magnificent bridge With a row of arches he has spanned this river This deep river, whose waters are rushing fast Over whose waters his predecessors could not build its like But with the help of God his Excellency the Pasha could do it So that his name would be remembered with honor and gratitude He had this bridge built, the like of which is not to be found elsewhere in the world Surely no one will say that money employed in this way was ill spent My hope is that by the grace of God he who built this bridge Will have a life of good fortune, untroubled by mishaps of any kind Nihadi who witnessed the completion of its construction, wrote this chronogram. May God bless this wondrously great and most beautiful bridge. Obviously both translations underline the greatness of Mehmed Pasha and his legacy – a bridge over the deep mountain river. Thanks to the robust construction, the bridge survived several natural disasters, of which the flooding from 1896 was the worst. It completely submerged the bridge washing away the parapets and slightly damaging stone piers, but surprisingly - the main structure of the bridge survived this natural disaster. That prompts me to say - “Chapeau” for its constructor - Mimar Kodža Sinan as I’m sure that such flooding will wash-away most modern-era bridges. Subsequent reparation works carried out on the bridge stabilized and reinforced the structure. The new thicker parapets were installed along the bridge giving it today’s shape. These days the only trace of the flooding is the marble plaque attached to the central portal marking the level of water from this “biblical- proportions” event. But the “luck” ended here – what Mother Nature spared from destruction, humans finished using destructive force of dynamite. During both world wars the central arches of this strategic bridge were blown-up to slow down invading armies. WW1 brought destruction of pier 3 and 4. Ironically, right after the reconstruction was finished, the WW2 started bringing destruction of the large section including piers 3,4,5 and 6. And once again in this vicious cycle of “life and destruction” the reconstruction work carried in early 50’s gave back to the bridge its old splendor. But this was not the end of the story, the time of peace brought new “human-made” threats – this time from two close to the bridge hydro-power stations – one upstream and another one downstream. The dams profoundly modified the level of water and its rate of the flow near the bridge affecting foundation of the piers. Few years ago the bridge was finally closed to cars’ traffic and now can be fully enjoyed by tourists. In 2007, the Mehmed Pasha Sokolović Bridge in Višegrad was inscribed on the UNESCO World Heritage list, hopefully gaining a better protection. Mehmed Paša Sokolović (1505-1579) was a native from Bosnia. He was born to Serbian Orthodox Christian parents in a small village Sokolovici near today’s Višegrad. Following the so called “blood-tribute” policy imposed by Ottoman Turks on conquered nations, Sokolović in his child-age was taken by force from his parents. He was then sent to Istanbul to be converted to Islam and under a new name Mehmed raised and educated as a soldier. Thanks to his well above average intelligence, skills and hard work he quickly reached the ranks of Empire’s military and political elite. Subsequently he was sent to Bosnia to occupy the highest administrative post of the Grand Vizier. The marriage with Princess Esnahn - daughter of Sultan Selim II confirmed his position within the political elite of the Ottoman Empire. Drina Bridge: Emerald Drina's waters beautifully contrast with the majestic silhouette of the stone bridge. Right photo - The table marks the peak level of water from the monstrous 1896 flooding. Drina Bridge: Most likely Drina River wouldn’t be the same without the old stone bridge over its waters. But honestly the river itself with its emerald green waters is a real beauty …. The bridge – one of the greatest achievements and legacies of Mehmed Paša and a tribute to his native land, physically connected the opposite banks of the Drina River. But in a wider sense the bridge also connected Muslims and Christians inhabiting opposite sides of the river creating more or less united a multiethnic community. In fact, it connected communities belonging to two completely different worlds – East (represented by the Ottoman Empire) and West (represented by the Austro-Hungarian Empire). Unfortunately as the latest history of Balkans tragically proved - only the “bridge” in its stone form survived few centuries of tumultuous times and wars. I hope you discovered something new and interesting on this page dedicated to the Bridge over the Drina River. Given the fact that you are already in Bosnia I would like to invite you just across the border to the world of fantasy created by the famous movie director Emir Kusturica - the ethno-village Kustendorf near Mokra Gora.